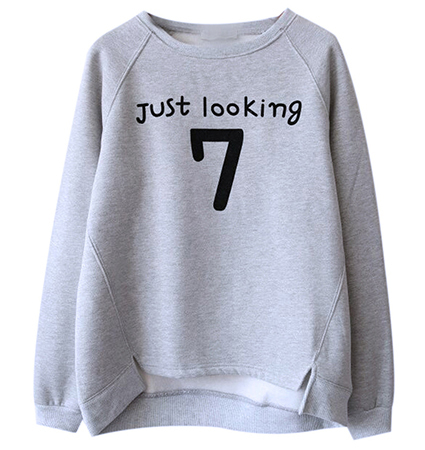 This comfortable, whimsical sweatshirt is a great looking shirt for your casual wardrobe It comes in gray, white or black and has a Number 7 logo on front with the words, “Just looking” printed above it. The shirt is designed in traditional sweatshirt style with a high quality, thick, cotton blend fabric to help keep you warm during the cooler months of the year. The front of the hem is slightly shorter than the back and has decorative notches on both sides. It has a conventional crew neckline with knit ribbing around both the neckline and the cuffs . The sleeves are long and roomy. This is a machine washable garment. It is available for purchase in sizes Small, Medium, Large and Extra Large.